And you didn’t register for the Institute of Genealogy and Historical Research for its June offerings. And after getting all the news out of FGS 2015 and RootsTech last week, you’re starting to feel distinctly left out on your genealogical education for 2015. Then it’s time to put on your sneakers and pack a lunch. Because registration opens tomorrow, Wednedsday, February 18th, for the six classes of the July session at GRIP — and those classes are going to fill up fast. 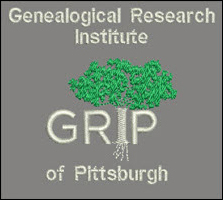 GRIP, of course, is the Genealogical Research Institute of Pittsburgh, going into its fourth season at LaRoche College in Pittsburgh. Co-directors Elissa Scalise Powell, CG, CGL, and Deborah Lichtner Deal have a terrific line-up of courses offering in-depth immersion for an entire week — this session runs from July 19th to July 24th — in a topic that just might be what you’re looking for. Understanding the laws that affected our ancestors is essential for kinship determination and successful research. Law School for Genealogists covers the waterfront as to the elements of the law that directly impact genealogical research: the legal systems underlying the records; the court systems; record series resulting from the legislative and judicial process; and topical treatments of the law of wills and estates, property, marriage, divorce, military service, immigration and naturalization and more. The class covers 19th through 21st century U.S. records and includes online resources. Prior to the course students will be able to send the coordinator a brief research issue of their own along with a listing of the U.S. places where their ancestors resided and what has already been researched. The course includes some “homework” that is optional but highly suggested. Students often find they like those learning exercises. An extensive syllabus including online resources is provided. Are you beyond the beginning stages of researching your family history? You probably have checked the basic records and done online searches but still have blanks to fill in. Maybe you need to gain more leads and judge the records but need some analytical skills for that. We will delve deeper into a variety of records, some that you may have never heard about, and where they may be accessed. During the week there will be some hands-on projects, small group discussions, and full class interaction as we develop research plans, delve into the records, and learn what may get those blanks filled in. The camaraderie of solving problems as a group leads us to great insight and also some fun. The field of professional genealogy offers multiple opportunities to find career success. During the week we will examine the steps to building a career in professional genealogy, looking beyond client-based research to provide best practices for strategic planning, marketing, developing products, and related topics. Faculty includes those working in across various dynamics within the industry, including commercial entities, small-business owners, small-proprietors, non-profit and more. Coordinators: Sharon Cook MacInnes, Ph.D. and Michael D. Lacopo, D.V.M. The course is designed for intermediate to advanced researchers who understand how the Genealogical Proof Standard forms the foundation for solid research but may not know much about Pennsylvania resources. The goal is to present a practical, in-depth, and fast-paced exploration of Pennsylvania record groups with a bit of fun and hands-on exercises. With comprehensive overviews of the records in which your ancestor may appear, the course will delve into how and where those records can be accessed, and demonstrate how the records should be used to expand an understanding of your ancestor’s life. Every one of our Pennsylvania ancestors has a tale to tell, and with knowledge gleaned from the resources discussed, you can tell it. DNA test results can be confusing and their application to genealogy unclear. This course is designed to provide the in-depth knowledge needed by those who wish to analyze results and further research goals for themselves, their clients, or a surname project. These three recognized experts in the field of DNA analysis will provide opportunities for practical, hands-on experience in analysis and correlation of DNA test results utilizing the latest tools and techniques and will give recommendations for further research. Tomorrow’s registration is only for the six courses to be offered at LaRoche College in July. But there are still seats in some June courses — you can still register for those on the June registration page!